Where can I play some pingpong in Berlin? A question I ask myself a lot, especially in summer. This is why I created a Top 5 pingpong spots in Berlin. Enjoy! 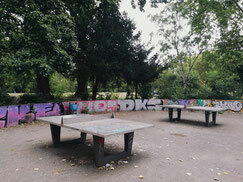 In the heart of Kreuzberg, next to the skate park at Böcklerpark you will find these pingpong table, just 10 meters further there are two more, but they are always occupied by pros. If you dont feel like challenging someone, you can play here. Close by is the Galerie König (where you – besides art – can enjoy some delicious cakes and coffee. For Berliners, it is the city’s green lung. 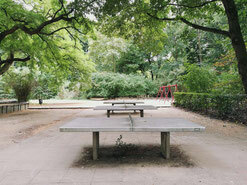 The park not only offers winding tree-lined paths and open green spaces, but is also home to many cultural and political sights AND pingpong tables, which are located opposite of the Spree and in the shade. Here you also find pros to play with and learn from! After exercising you also deserve to relax, for example at the beer garden Café am Neuen See. 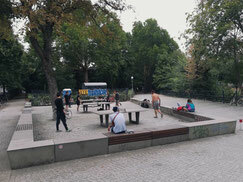 After enjoying a breakfast or delicious coffee at the cafés Hallmann and Klee or at Future Breakfast at the Böhmische Platz, you can get some exercise by playing table tennis. But watch out, at this little plaza adorable taxi drivers and flower shop owners are playing very professional. Here you can challenge the pros. In summer the trees give shade. And if you are hungry, W Pizza is just around the corner. Close by is also the bridge Lohmühlenbrücke where you can drink a beer after work or a playground for the children (on it are also ping pong tables, in case the other ones occupied. The area became a wasteland at the end of WWII, and developed a rich diversity of vegetation almost unnoticed. 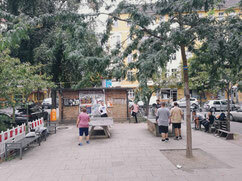 Take a stroll through the park on your way to Kreuzberg. It is home to a number of different amenities — everything from a skate park, a railway museum, a rose garden, children’s play areas, even a sandy beach (with volleyball courts! 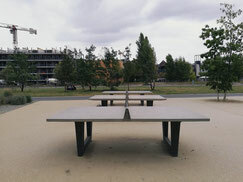 - check www.beach61.de for times), AND also a lot of pingpong tables, which are normally not occupied! Note: It is not wind-protected! Still lost? Well than you can also search with www.pingpongmap.net for pingpong spots in Berlin!